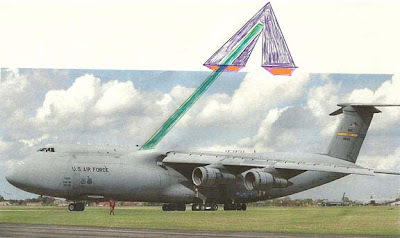 Listening to Coast to Coast AM this week a very interesting report came in directly from a US airforce pilot who recounts experience with a huge beam emitted from a Ufo directly over his USAF c-5 plane while it was still on a US Airforce base . The UFO was particularly interested in the cargo of the aircraft and monitored it with this 'beam' for some time. He details his experience from 1969 in the below Radio interview with Linda Moulton Howe which i highly recommend listening to. Although we don't know what the cargo was in this case, it is well known that many direct Ufo cases occur on military bases specifically with the intention to disable and monitor nuclear weapons ( i have posted about this link numerous times).